Le Privè There are 4 products. You need to find the best selection of footwear Le Privé? A wide range of Young Shoes of footwear, with particular creations for every contemporary taste. The collection includes models for every taste, to match with any outfit. A lot of models, from ankle boot woman to wingtip shoe with medium heel, but also boots and many more based on your look. Simple and with refined details, with zip or other finishes. Le privè satisfy the needs and creat design that every woman loves, very impeccable in any occasion to enriche your look! The Brand Le Privè stands for class and elegance with casual clothes with a touch glamour that gives your outfit very particular. All Made in Italy, the brand is loved a lot by women that want to feel irresistible. On Young Shoes you can find many offers. The brand Le Privè choose the shoes adapt for any occasion. 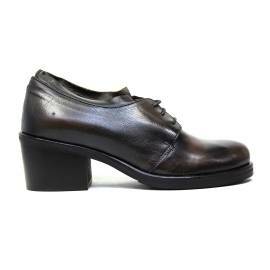 His models are in fact the complete expression for every needs for women that shows his particular products like wingtip shoes with medium heel: realized in leather and mouse color. Also models realized entirely in leather with precious details and refined on the back of shoe, adpat for any special occasions. Ideal also the ankle boot are ideal shoe for the seasons for the cold and differend models available in the collection Le Privè satisfy every needs: from the high to low, you can find your favourite shoes that fits for you. Also a wingtip shoe perfect for valorize your look. On Young Shoes you can find the best models for every brand. You can order the shoes that you desire. In less than 24/48 hours you will be amazed having on your foot a shoe with a unique style.